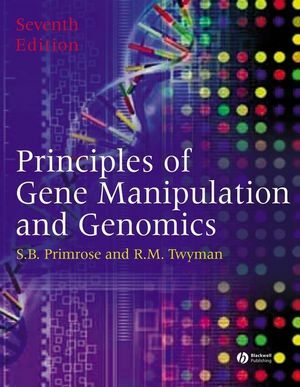 The increasing integration between gene manipulation and genomics is embraced in this new book, Principles of Gene Manipulation and Genomics, which brings together for the first time the subjects covered by the best-selling books Principles of Gene Manipulation and Principles of Genome Analysis & Genomics. An accompanying website - www.blackwellpublishing.com/primrose - provides instructional materials for both student and lecturer use, including multiple choice questions, related websites, and all the artwork in a downloadable format. An essential reference for upper level undergraduate and graduate students of genetics, genomics, molecular biology and recombinant DNA technology. Sandy Primrose was an academic for 10 years and a senior manager in the biotechnology industry for 20 years. He now manages a consultancy practice focused on technology management. Richard Twyman worked as a research scientist at the University of Warwick and at the MRC Laboratory of Molecular Biology in Cambridge before taking up scientific writing as a full time occupation in 1998. He is currently a Visiting Fellow at the Department of Biology, University of York, and a freelance scientific writer and teacher. 1. Gene Manipulation in the Post-Genomics Era. Part I: Fundamental Techniques of Gene Manipulation:. 3. Cutting and Joining DNA Molecules. 4. Basic Biology of Plasmid and Phage Vectors. 5. Cosmids, Phasmids and Other Advanced Vectors. 7. Sequencing Genes and Short Stretches of DNA. 8. Changing Genes: Site-directed Mutagenesis and Protein Engineering. Part II: Manipulating DNA in Microbes, Plants and Animals:. 10. Cloning in Bacteria Other Than Escherichia coli. 11. Cloning in Saccharomyces cerevisiaea and Other Fungi. 12. Gene Transfer to Animal Cells. 13. Genetic Manipulation of Animals. 14. Gene Transfer to Plants. Part III: Genome Analysis, Genomics and Beyond:. 16. The Organization and Structure of Genomes. 17. Mapping and Sequencing Genomes. 19. Large-Scale Mutagenesis and Interference. 20. Analysis of the Transcriptome. 21. Proteomics I – Expression Analysis and Characterization of Proteins. 22. Proteomics II – Analysis of Protein Structures. 23. Proteomics III – Protein Interactions. 24. Metabolomics and Global Biochemical Networks. Part IV: Applications of Gene Manipulation and Genomics:. 25. Applications of Genomics: Understanding the Basis of Polygenic Disorders and Identifying Quantitative Trait Loci. 26. Applications of Recombinant DNA Technology. "Principles of Gene Manipulation and Genomics is well written and clearly illustrated throughout, as would be expected from these authors who have considerable experience in this subject."